There are many differences between the speeches that we give in “the real world” and the ones that we’ll deliver in a business setting. However, there is one thing that both of these types of speeches have in common: we need to use our eyes correctly. What this means is that we need to remember that both ourselves and our audiences are human beings. Because of this, we both send and receive a great deal of communication when we are talking by using our eyes. If we don’t do this correctly, then our message is going to come across as being garbled and confused. Due to the fact that delivering any speech in a business setting can be a high pressure undertaking, it is perfectly natural for the speaker to not want to make eye contact with his or her audience. Instead, we’d prefer to focus on our notes or our slides so that we can make sure that we’re getting our words to come out correctly. You need to be very careful to not do this. Take the time to look everyone in the room in the eye while you deliver your speech. It’s only by doing this that you’ll be able to come across as being honest and believable. The idea that you are presenting will be much better received if you are able to connect with your audience by making eye contact with each and every one of them during your speech. The one thing that your audience does not have enough of is time. We are all starved for time these days and so the simple fact that your audience took the time out of their day to show up for your presentation should be taken as a compliment to you. Once you have them sitting before you, you then need to treat their time as the valuable thing that it is. The presentation that you give needs to be as short as you can make it. The trick here is to make sure that you completely cover all of the required information while at the same time using as few words as is possible. I must confess to wanting to include everything that I know into a speech so that my audience will walk away knowing as much as I do about a topic. You must resist this. Instead, think about what you want your audience to be able to remember and to repeat after your presentation. Once you know this, then you’ll know what needs to be included in your speech – and what you can leave out! The goal of any business speech is to make contact with your audience and to get them to agree with your idea and perhaps approve your proposal. In order to make this happen, you need to take the time to make eye contact during your speech with everyone in the room. You’ll also have to respect the value of their time and work to keep your presentation as short as possible. 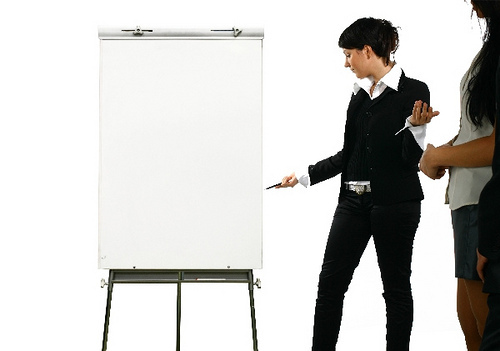 Question For You: What do you think is the correct amount of time for a business presenation?